This is an example of the classic type of Neolithic arrowhead, generally known as a leaf-shaped arrowhead for obvious reasons! They are generally dated to the earlier Neolithic, between 3800 and 2500 BC. This one was found at Tarbat, Portmahomack, but similar ones are found throughout Scotland and Britain. Arrows such as these were essential for hunting or warfare, but the bows or shafts almost never survive. 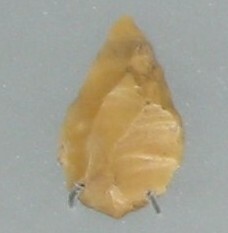 Arrowheads were made by chipping away (knapping) cores of flint or other available stone, using the pressure flaking technique. Producing an arrowhead of this type required skill and patience. There are several possible production sites in the area, including at Cuthill Links near Dornoch. The SCRAN website contains a series of good videos showing how such arrowheads were made, and then how they were attached to the shafts. (Note that you need to be a subscriber to the full use of SCRAN to view the videos, so view at the Highland Council library if you are not.) A number of websites also have descriptions or videos showing how such arrowheads are made - just google flint knapping arrowheads. Arrowheads from the Bronze Age are of a different form (barbed and tanged), so that a leaf-shaped arrowhead provides useful dating evidence when found. This object is on display at the Tarbat Discovery Centre in Portmahomack, Easter Ross. Most books describing the Neolithic in Scotland will discuss stone tools and arrowheads.